Today I went along to the Asian Civilisations Museum to attend the awards ceremony of the Doodle 4 Google Singapore competition. There were 50 finalists in all, five in each age category, from a total of almost 30,000 entries. One winner in each category and an overall National winner were announced today. Before the ceremony there were some fun activities organised for the children, whose ages ranged from 4-19, and Captain Amazing with his friends Coconut the Monkey and Kenny the Friendly Chicken (KFC) entertained the crowd. Seventeen-year old James Rotanson, from Anglo-Chinese School clinched the top prize, with his gorgeous Doodle, "Colors of Singapore". 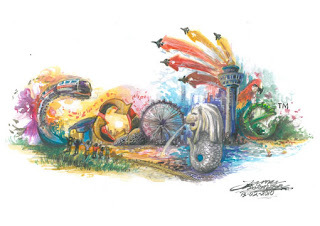 As I look at this drawing more and more elements pop out at me and I think it is a beautiful representation of the values and icons of Singapore. The winner in each age category received a Macbook Pro, a personalised trophy, and an exclusive Google Aps workshop for their school teachers. The Macbook Pro was a special surprise for everyone and even the winner of the 4-6 year age group, Pradyot Dubey, from DPS International School, was thrilled. 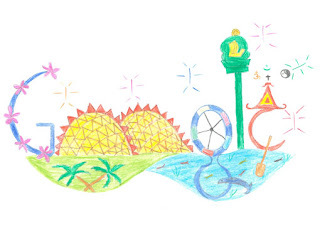 I asked Pradyot about his Doodle and he told me about the different elements in the drawing, from the Orchids, the Singapore Flyer and the Chinese temple as well as the dolphin swimming in the ocean. He is a keen drawer and his parents and teacher are extremely proud of him. Dennis Hwang, the original Google Doodler had the honour of choosing the overall winner, and although he could not be present today, Dennis sent a special video message saying how impressed he was with the standard of creativity and that he had a very tough job choosing the overall winner. There were almost 30,000 entries in the Singapore competition, which is 8 times the amount of entries in India in the same competition last year. This is pretty phenomenal, and I don't think anyone realised how this competition was going to ignite the imagination of Singapore's children and students. You can still view all the finalists at http://www.google.com.sg/doodle4google/index.html and click on the 'vote now' button. You can also go and view all the 50 finalists' Doodles at level 1 of the ASM from 30April until 23 May. Heehee, you said "He is a keen drawer" maybe your children will say you are a cooker next time. Oh dear, you are right! 'He is keen on drawing' or something like that sounds better? Good to know there is some English police out there-thanks! !